Paul Roberts’ book is now available to purchase! Order your copy of History Maker here. 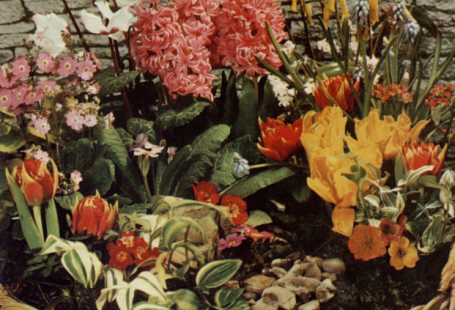 I found the picture by pure chance – on a village history website. 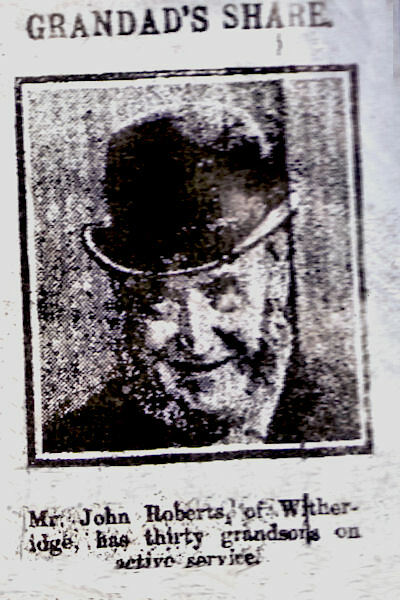 It was of John Roberts, a man with a bushy beard and sideburns and wearing a bowler hat and a big smile. A caption below it was extraordinary. It said he had 30 grandsons serving in the Great War. I had no idea who he was at that stage. But he looked familiar – just like my father. I kept the picture, checked it out, and found to my amazement that he was my great-great-grandfather. The discovery marked the start of a quest to find all I could about John and his grandsons. A father of 15 children, he had almost 100 grandchildren and lived to the ripe old age of 90, dying in 1919. After spending 10 years researching his remarkable life, I believe John, a humble agricultural worker from Witheridge in Devon, may have had more grandsons serving King and Country than anyone else in his home county and beyond. I have traced 20 of his grandsons who served on the Western Front, in Mesopotamia, Gallipoli, Egypt, and Palestine. They included my grandfather, George Burnett Roberts, who served as a horse transport driver in the Army Service Corps. Seven never made it home. 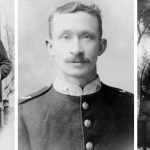 Several had remarkable escapes from death – one after being shot in the head and another who survived two of the greatest cavalry charges ever. The British Newspaper Archive has played a pivotal role in helping me to discover those who died or were wounded on the front line, the horrors they endured in the trenches in France and Flanders, and the immense courage they showed in the face of the greatest adversity on the Western Front and in the deserts of the Middle East. 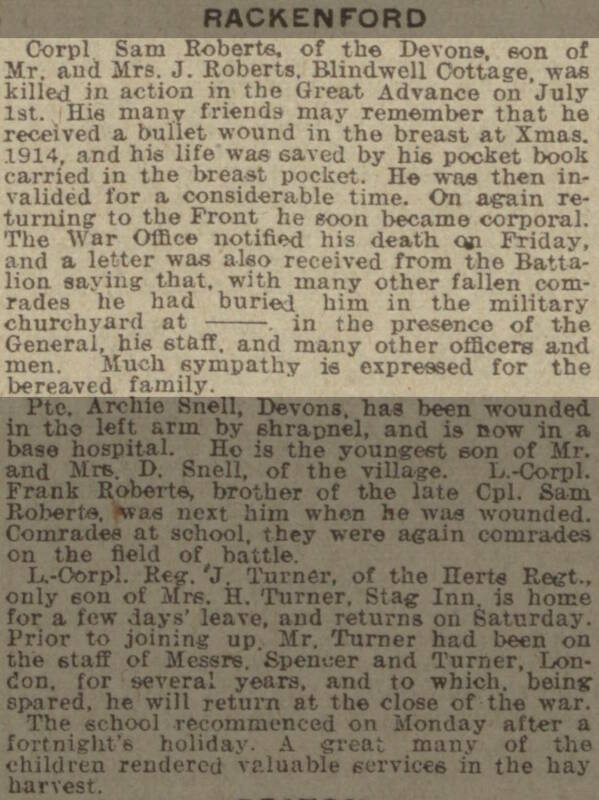 Old Devon newspapers researched on The Archive revealed how one of John’s grandsons, Corporal Sam Roberts, was shot in the chest by a sniper while serving in the Devonshire Regiment in France just before Christmas in 1914 – and survived because the rifle bullet first hit a small book kept in his shirt pocket. 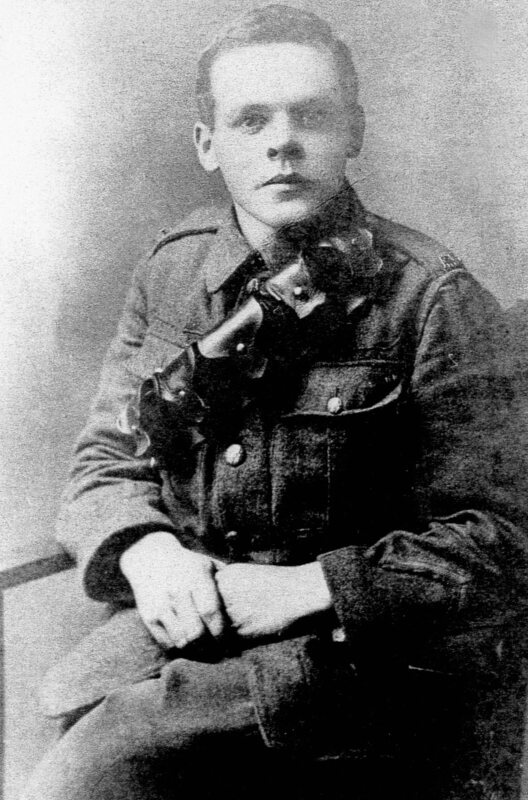 Sam returned to the front line a year later and was among more than 19,000 British soldiers killed on the first day of the Battle of the Somme, on 1 July 1916. 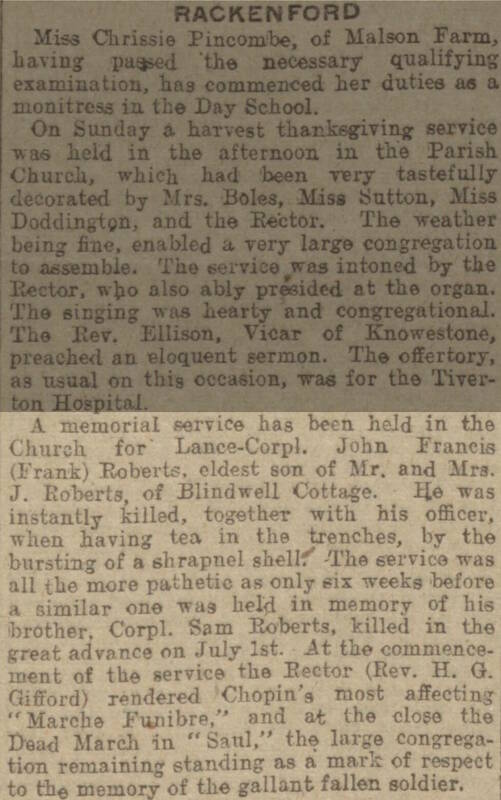 His death, burial in the Devonshire Cemetery in Mametz, and a special memorial service at his village parish church were recorded in The Western Times, one of the hundreds of newspapers featured on The Archive. 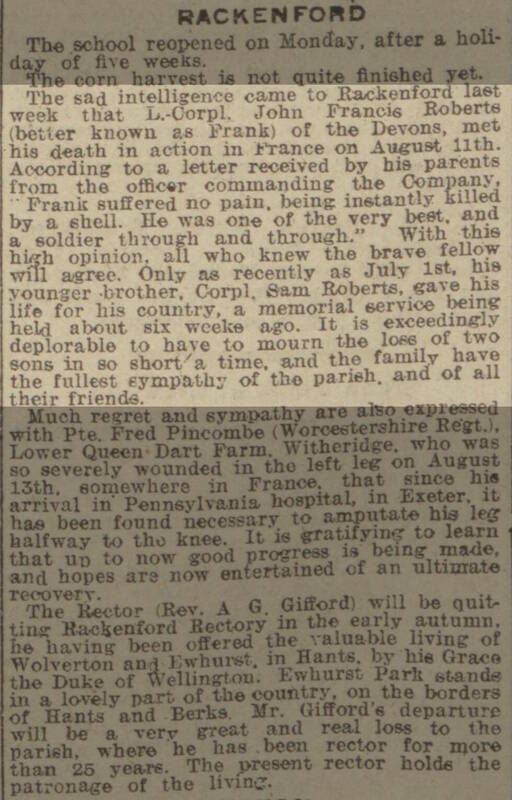 The tragic death in a trench in France of Sam’s brother, John Francis, just over two months later, was reported in the same newspaper, along with a tribute from his senior officer. 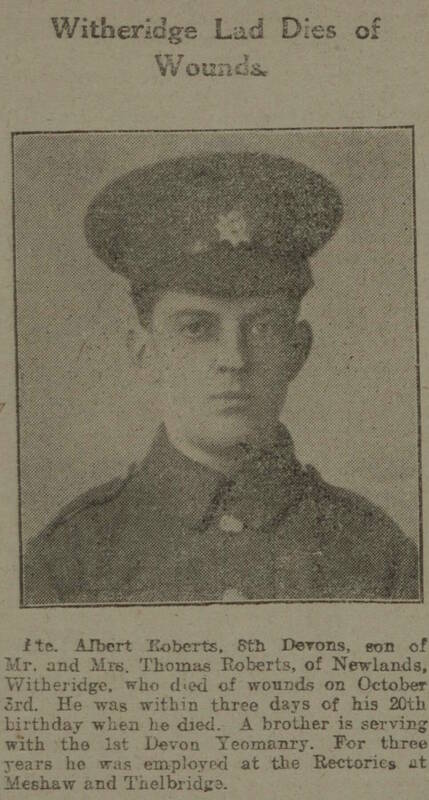 The youngest of John’s grandsons to die in the war was 19-year-old Albert Roberts, a private in the 8th (Service) Battalion of the Devonshire Regiment. I had heard about Albert as a young boy. He grew up in the village where my father was born and is remembered on the local war memorial. It was a poignant moment when I found a picture of him in his uniform on The British Newspaper Archive, published in a local newspaper shortly after his death in France in October 1915.
Letters from the trenches from soldiers who fought side by side with John’s grandsons – sent home to loved ones and frequently published in their local newspapers – offered a chillingly realistic glimpse into the lives they lived on the front line and the battles they took part in, from the First Battle of Ypres in 1914 to offensives at Neuve Chapelle, Aubers Ridge, Loos, and on the Somme. 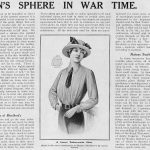 Pages on The Archive – notably from The Western Times, The Devon and Exeter Gazette, The North Devon Journal, and The Western Morning News – have provided a graphic and invaluable insight into the tremendous sacrifices made by many of Devon’s families in sending fathers, sons, brothers, uncles, cousins, and friends to war. Some had up to nine sons serving in the Army and Navy between 1914 and 1918. Without The British Newspaper Archive, it would not have been possible within my lifetime to carry out the research necessary to complete my book about John and his grandsons. I remember the days when I had to do my searches the old way, ploughing through thousands of newspaper pages stored on microfilm or in enormous binders, often without success. So, I owe The British Newspaper Archive a big thank you. And would recommend it to anyone researching men and women who served in the Great War. 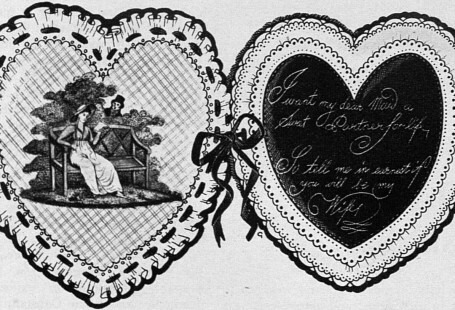 The newspaper pages within The Archive – from the local news columns written by village correspondents to the comment and headline stories of the day – have offered a wealth of information that has helped me to turn a seemingly endless project into reality. 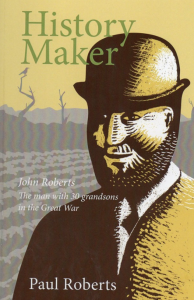 The story of John and his grandsons is told in History Maker: John Roberts – the man with 30 grandsons in the Great War. Thank you Billy for taking the time to read the piece about John and his grandsons. So many people disappeared into the shadows of history in the era of the Great War. John and his grandsons are now being lifted from those shadows. 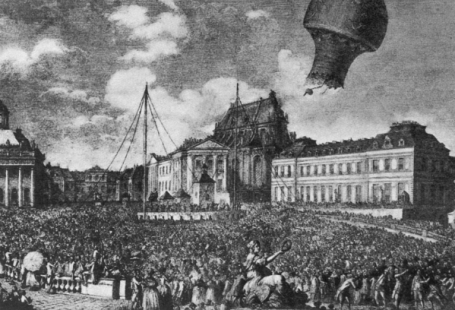 The stories of ordinary men who achieved extraordinary things in exceptional times are being told for the first time. I saw you piece on Spolight & thought I’d do a bit of digging! It turns out that my father Gerald Roberts is the nephew of Sam & Frank. Therefore John Roberts would have been his Great Uncle. Gerald’s father was called Charles & was born in 1903. I believe there was another brother called Ben & 3 sisters? 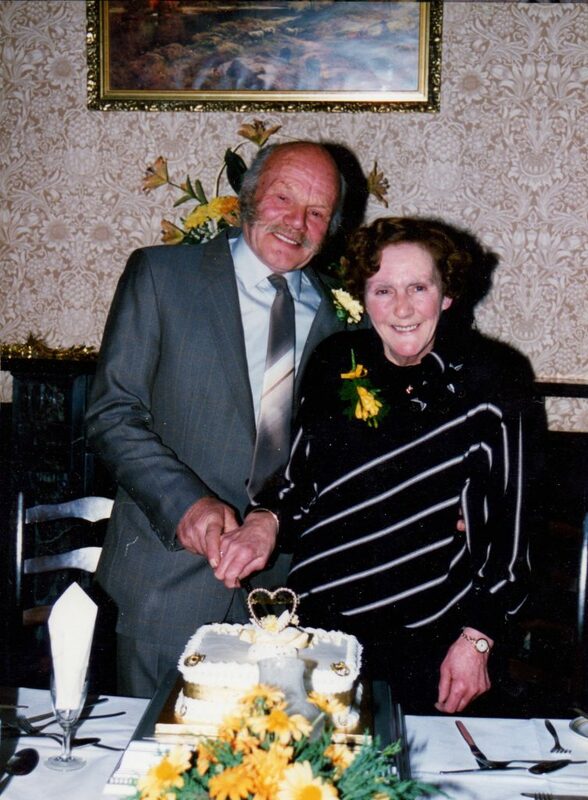 I would love to hear from you & dad (Gerald) could maybe help to fill in any blanks?